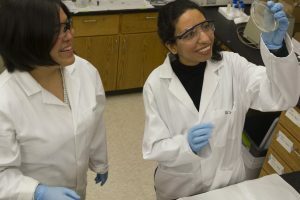 Ikuma (left) and Da’Er prior to research in their environmental engineering laboratory. (Photos by Kate Tindall). Da’Er is a first-year doctoral student at Iowa State University (ISU). 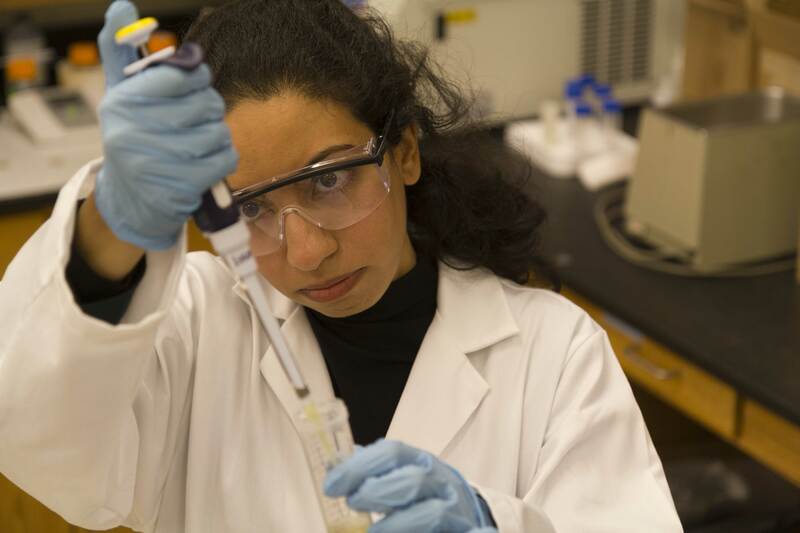 She was awarded an interdisciplinary scholarship from ISU’s Graduate College and the civil, construction and environmental engineering (CCEE) department to pursue research of sustainable wastewater treatment. Along with Kaoru Ikuma, an environmental engineering researcher and assistant professor in the CCEE department, Da’Er will seek solutions to water crises like the one that has rocked her homeland. 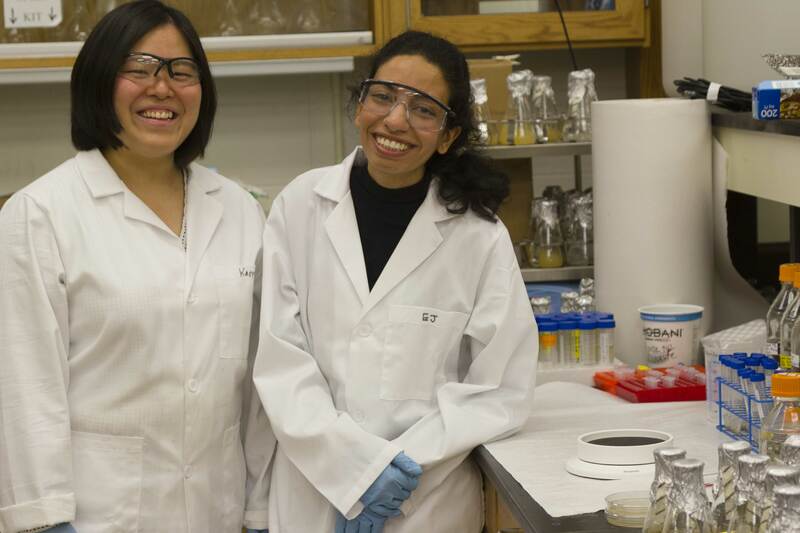 Both Ikuma (left) and Da’Er work with algae samples to develop cost-effective wastewater treatment systems. When you talk to Da’Er, she is so serious as she relates her experience that you cannot help but feel empathy. She once spent nearly four years working for the non-profit Social Fund for Development – Yemen. There, she monitored the effects of various water harvesting projects during a steadily growing humanitarian crisis. Da’Er knew she could make the most impact in Sana’a if she were a researcher and a professor. She decided on ISU after happening on a news story about Ikuma’s work. The pair research the use of algae as a cost-effective solution for wastewater treatment. Da’Er uses a pipette while working with cultures in the lab. Both environmental engineering and environmental science researchers will work with Ikuma and Da’Er in the coming months. With her experience and drive, Ikuma has found a dedicated student in Da’Er. “She strongly recognizes the need for water—safe water—and wants to go above and beyond in her education and research to better understand it and ultimately become a leader in the field,” Ikuma said. If you’re interested in learning about the exciting opportunities open to graduate and undergraduate students at ISU CCEE, follow us on Facebook, Twitter and LinkedIn (Iowa State University Civil, Construction and Environmental Engineering and ISUConE).